The picture captured, among other things, an increasingly rare sign of comity between the state’s chief executive and its largest university. But Neal was a special exception. Shortly after he got the head coaching job, in April 2013, Neal and his wife were invited to a steak dinner of intimates at the Governor’s Mansion. The attendees included Martinez and the First Gentleman, Chuck; UNM Athletic Director Paul Krebs and his wife, Marjori; Jay McCleskey, the governor’s political strategist, and his pollster wife, Nicole; and UNM Board of Regents President Jack Fortner and his wife, Terri. “We sat down, we ate, we talked, we laughed. In my mind, I forgot I was sitting with the head coach of the UNM basketball team,” Martinez would later recall of the evening, in an interview with the Journal. But Alford, who is infamously standoffish, never really needed Martinez. He came to Albuquerque celebritized in his own right, and his Lobo program had already been richly garnished by the previous governor, Bill Richardson. Alford’s indifference to Martinez, multiple insiders would later tell NMFishbowl.com, was taken as an icy affront by an administration notorious for its hypersensitivity to slights. Neal, on the other hand, was more than willing to play ball. A more natural schmoozer than Alford, he also liked counting his celebrity friends — and a rising star in Republican politics would make for a nice addition to a quiver that included some former NBA players, pro golfers and Benicio Del Toro. With Neal as hoops boss, McCleskey was given an all-access pass to the inner sanctum of Lobodom: he and Neal spoke often on the phone, according to sources, and McCleskey would not infrequently be seen yukking it up in the UNM men’s basketball offices. McCleskey’s son even got a gig as a mop boy at Lobo home games. Nevertheless, in the yawning leadership vacuum at UNM, Neal was elevated to the role of (at least putative) powerbroker. Whether accurate or not, there grew a sense that if the Lobos wanted something from Santa Fe, Neal should make the call. This perspective, according to multiple sources, became the accepted wisdom even in the uppermost reaches of the university. To Martinez, Neal represented a potentially valuable in-state celebrity to align with during her second term in office, especially as her administration became more interested in UNM. Still, others couldn’t decipher much of a political justification to their growing rapport. “I think Susana had a crush on him, and that is what it is,” said Eaves. For McCleskey, too, the interest in Neal seemed to be principally that of a fan. Whatever this nexus would — or would not — yield for the university, it meant something very discretely for Neal, who struggled to live up to Alford’s success. “I believe Coach Neal would have been terminated a year earlier were it not for the support of Governor Martinez,” said former UNM Regent Gene Gallegos. The unique alliance between poll-plummeting governor and win-starved basketball coach provides a keyhole into a much larger phenomenon that has played out at UNM. The state’s largest institution of higher education has steadily become, in today’s jargon, a political swamp — one that has fostered an inbred and invasive specie of self-preserving creature. What began with Richardson’s consolidation of executive authority in the early aughts has, a decade and a half later, reached a pathological state in the second term of the Martinez administration, as good governance is regularly subsumed by score-settling, personal agendas, and astonishing fits of pettiness. Culminating with the appointments of the current regent leadership, Rob Doughty and Marron Lee, the dynamic between Santa Fe and Scholes Hall has grown so confrontational as to rival ex-Texas Gov. Rick Perry’s holy war against UT-Austin. Much of the conflict, on the surface, has centered around a battle for control of the university’s medical infrastructure, but so many small-minded turf fights and power plays have mutated across the campus — one almost needs an iPhone app to keep track of them all. In January, Gary Gordon, a prominent university benefactor and past chairman of the UNM Foundation Board of Trustees, circulated a letter announcing that he was withdrawing his financial support from the school. Given the university’s faculty turnover problems and the austerity measures it has been forced to take, the political contagion has only sunk the institution’s psyche into deeper despair. Furthermore, it represents an existential threat to UNM, which has fallen under accreditation scrutiny in recent years for its perceived lack of shared governance. As NMFishbowl.com recently reported, the school’s accreditor is again casting a quizzical eye at the university, in light of two state investigations into its Athletic Department’s financial behavior. Though Martinez came into office displaying nominal interest in higher education policy, the machinations of UNM have consumed her administration at its denouement, leaving many to wonder about ulterior motives. The growing list of the bewildered includes Jose Garcia, who served as Martinez’s first higher education secretary, from 2010 to 2014. Indeed, many on campus have come to see the telltale signs of an administration trying to clear the way for its officials’ future employments. Although there have been growing rumblings of Martinez herself trying to secure a post-gubernatorial gig in higher ed, the more acute fixations center on Barbara Damron, the current secretary of higher education, and Keith Gardner, the governor’s chief of staff. It’s been widely rumored that Gardner is interested in landing a top position (if not the top position) at UNM’s Health Sciences Center — a la former Richardson spokesman Billy Sparks, now the HSC’s communications director — while Damron is thought to have the inside track at becoming the school’s next president. This story incorporates interviews with more than 50 sources, many of whom agreed to talk on the condition they not be named. While perspectives vary, a despondent theme emerges from these conversations: as troubled as UNM may look from recent newspaper headlines, things are even more deranged behind the scenes. “I have been surprised about how bold the corruption is in New Mexico,” said one former UNM administrator, who departed within the past year. It appears nothing, these days, can escape the event horizon of hackery — not even something as seemingly apolitical as the affairs of Bob King Court. Like it or not: politics is baked into the governing cake of New Mexico’s public universities. Article XII, Section 13 of the state’s Constitution provides that the governor is entrusted with appointing a seven-member board of regents at the University of New Mexico, which the state legislature must confirm. The regents’ terms are to last six years, except for a student regent, who serves for two years at a time. The non-student members can seek unlimited reappointments. The position of university regent, especially at UNM, has long been regarded as one of the most cherished political appointments, and has therefore frequently been given by governors to those who have handsomely given to them. Still, there is a sense that, throughout the state’s history, regents have largely operated with the best interests of the universities in mind — and that governors have mostly allowed them to do so. The constitutional provisions regarding university regents in New Mexico largely mirror those of most other states, but there are some key distinctions. In Arizona, for example, a single board of regents presides over all of the state’s public universities, whereas in New Mexico, each of the schools are overseen by distinct boards. The New Mexico Constitution tries to curtail partisanship by requiring a threshold of political diversity among the regents: only four of the six regents on a board, at the time of their appointments, can be members of the same political party. The Constitution also tries to protect regents from political interference by establishing certain guidelines for their termination. Sitting regents cannot be removed from their positions “except for incompetence, neglect of duty or malfeasance in office,” the Constitution states, further stipulating that the New Mexico Supreme Court — not the executive branch — has the final say over removal proceedings. In the mid-1990s, then-Gov. Gary Johnson created a stir when he attempted to discharge Diane Denish from New Mexico Tech’s Board of Regents, prior to her successor being confirmed. A lawsuit was filed and Johnson eventually backed off, admitting in court that his effort “may have been premature.” But Johnson, consistent with his libertarian-inspired approach towards state government, remained largely hands-off when it came to places like UNM. That was not the case for Richardson who, upon assuming office in 2003, demanded the immediate, voluntary resignations of every university regent in the state. Richardson went on to appoint a full new slate of regents, 23 in all, contingent on them signing letters of resignation that would allow him to circumvent their constitutional protections. The move, for better or worse, signaled a new era of influence from on high. A self-styled, “pro-growth” progressive, Richardson envisioned UNM as the main turbine of his economic initiative, and he greased it accordingly. “He viewed the university as being a real valuable resource for helping build and diversify the economy in New Mexico,” said Eaves, who was one of Richardson’s first appointees. With the state’s coffers brimful, Richardson was happy to shower UNM with cash. Jack Fortner, a Republican lawyer from Farmington, who Richardson reappointed to the Board of Regents in 2005, largely agrees with that assessment. Even if Richardson didn’t necessarily have his hands on the dials, he had his people in place. In 2004, amidst a grand-jury investigation into pay-for-play allegations, the governor’s deputy chief of staff, David Harris, left to become UNM’s executive vice president. Other Richardson aides would also find cushy landing pads at the university, to the admonitions of watchdogs and the wails of Republicans. Perhaps most consequentially, Richardson tapped Jamie Koch, the ultimate political insider, to work his magic on the Board of Regents. Like almost every important player involved in this story — including Richardson — Koch had a personal and powerful connection to UNM athletics. A former UNM football player and wrestler, with a family legacy in the state’s ski industry, Koch would ultimately quarterback a massive facility expansion for the Lobos. But political gamesmanship placed equally high in Koch’s list of private loves. Having once served in the legislature and helmed the state Democratic Party, Koch earned a well-deserved reputation as one of the savviest Roundhouse functionaries, a force of nature capable of turning enemies into friends (or, at least, “friends”). He had done as much with Richardson. In the mid-1990s, while still a congressman contemplating a gubernatorial run, Richardson lost a court battle over whether he could use his federal campaign monies in a potential statewide race. The state legislature had just passed a series of ethics reform bills, which had been proposed by a task force appointed by then-Democratic Gov. Bruce King. Koch, one of King’s top donors at the time, had been a leading advocate on the task force for a law prohibiting the reallocation of federal funds to New Mexico elections. Richardson allies accused Koch of pushing the law merely as a way of neutralizing the threat of Richardson challenging King in a primary; Koch denied this was his intention. But all that was just runoff down the Rio Grande by the time Richardson won the governorship in 2003, thanks in no small part to Koch’s largesse. Richardson in turn made Koch, the owner of the Santa Fe-based Daniels Insurance agency, a regent at UNM and backed Koch as he assumed unprecedented power on the Board. Koch became the first regent president in memory to hold the gavel for more than two consecutive years, serving in that capacity from 2004 to 2009. While Koch undertook high-profile efforts to bring greater transparency to UNM’s governance, he also diligently worked the inside game, overthrowing the former regent president, Larry Willard (who Koch claimed had conflicts of interest) and furthering his own authority. Presiding over an epoch of administrative upheaval at UNM, Koch became king. Koch laughs off such characterizations of his influence and said, as leader, he made certain the process was transparent and inclusive. “If they call that political, I guess that’s political, but we selected the (presidents) with the most votes,” he said. While Koch’s passion for the university was deep, it was not necessarily all-encompassing. To many on campus, he seemed most concerned with athletics and economic development, specifically building up UNM’s health sciences facilities. Richardson said that it was because of Koch’s recommendation that he pushed for a cigarette tax in 2003, with millions of dollars of revenue earmarked for the UNM’s hospital and cancer center. Koch, for his part, made certain that the hospital’s new pavilion, completed in 2007, was named for the governor. But not everyone loved him in this role. Koch could be predisposed to the high horse, and was known for turning board meetings into long monologue sessions. Faculty leaders found Koch far less engaged on matters of their concern, and some viewed him to be openly hostile to the school’s educational prerogative. In 2009, bristling at the high-handedness of the school’s leadership, UNM’s faculty issued no-confidence votes against Koch, Harris and then-President David Schmidly. Among those who led the revolt was Chaouki Abdallah, chair of the engineering department at the time, and now the school’s current interim president. In response to the rebuke, Koch officially stepped down as Board president, but remained a regent — and arguably still the most powerful one. Even Bill Richardson had a significant sweet spot for UNM sports. The governor would be seen several times a season at men’s basketball games, festooned with his trademark cherry-colored scarf, in seats just behind the visitor’s bench. Never one to miss capitalizing on a social outing, Richardson would often be joined on these forays by a cabinet secretary, political donor or Democratic legislator. At Lobo football games, Richardson was known to luxuriate in the west-end suite belonging to Paul Blanchard, the Albuquerque Downs president, and one of the governor’s most influential and controversial backers. Richardson recalls one occasion when he took Ritchie McKay, then the head men’s basketball coach, along for a junket to Nike’s headquarters in Oregon. McKay, Richardson said, had told him of his close connections to Nike CEO Phil Knight and Richardson was hoping to land a division of the shoe giant in New Mexico. As with McKay’s on-court performance, the trip failed to deliver. But Richardson delivered for the Lobos, and then some. In 2005, he and the Democratic-controlled legislature allocated the capital outlay monies necessary to build the $4.2 million Rudy Davalos Center, UNM’s basketball practice facility. Four years later, Richardson’s Board of Finance approved a $59 million renovation of The Pit, with $18 million coming from state funds. When Steve Alford became the Lobos’ coach, Richardson said he would occasionally encounter him and Neal, then the top assistant, while on the road. A former college pitcher, who once falsely claimed he had been drafted by the Oakland A’s, Richardson had a special place in his heart — and the state’s budget — for Lobo baseball. In 2010, Richardson appropriated $2 million from the state to help fund a $12 million renovation of UNM’s baseball field. Joining in the mission, Johnny Cope and R.D. Hubbard, two more of Richardson’s equestrian megadonors, ponied up $500,000 apiece for the project. At first, UNM had planned to name the ballpark Cope Field, but backed off when the newly-elected Martinez warned that her administration would be resistant to helping out if the project carried the name of a Democratic moneyman. Hubbard, who has since become a significant political contributor to Martinez, donated another $500,000 to Lobo baseball in 2013, spearheading the construction of a new clubhouse that now bears his name. So far, the current administration has expressed no qualms with that. Conservative politicians have traditionally evinced a philosophical wariness of public universities, which often radiate liberalism and consume large chunks of state budgets. So it stood to reason that when Martinez became governor in 2010, amidst the Great Recession, things would change for UNM. But it was not immediately clear how dramatic that change would be. During her candidacy, Martinez didn’t really address higher education from the stump, although she did make a broader case about cutting government waste and runaway public spending. Campaign veterans remember that former Republican Gov. Garrey Carruthers, then dean of NMSU’s business school, would occasionally pitch higher ed policy proposals to the Martinez campaign. As for UNM, there seemed to be few concrete thoughts among Martinez advisers other than a brooding sense the university had been overrun by Richardson cronies. Garcia, an NMSU political science professor and registered Democrat, supported Martinez throughout the 2010 campaign, repeatedly heralding her eventual victory in press interviews. But he speaks now of his four-year tenure in Martinez’s cabinet with barely-concealed disgust. Garcia said the administration came into office believing too much money was being spent on too many schools, given the meager performance results. He was tasked with putting together a funding formula that would reward universities for producing more degree recipients. Garcia worked intensely on the endeavor, he said, but when it came time for implementing it, the administration showed little appetite to engage. “They had absolutely no interest in any of this,” Garcia told NMFishbowl.com. He added that while Martinez “backed me a lot” in the first two years, she “kind of lost interest” after that. Perhaps betraying her disinterest, Martinez reappointed two Richardson holdovers, Koch and Fortner, to UNM’s Board of Regents. As Koch was to Richardson, Fortner would now be Martinez’s man on the ground. But whereas Koch was seen as an authoritarian, Fortner, who became the Board’s president in 2011, garnered the reputation of an errand boy. “I was actually surprised when they let him be president and I really thought he was a president in name only,” said Chastain. The Martinez appointment marked the third consecutive administration for which Fortner served, a singular feat of political ingratiation. Making friends with those who matter has been a Fortner calling card for the last three decades, although that alone undercounts his talent. The lawyer and longtime San Juan County Commissioner has, time and again, proven himself gifted at spotting dark-horse political candidates — and then leaping aboard their chariots. Fortner was an early supporter and eventual kitchen cabinet confidant of Gary Johnson, his former UNM classmate. When Johnson won the governorship in 1994, Fortner immediately asked him for a spot on UNM’s Board of Regents; Johnson gave the nod four years later. Although a well-heeled Republican, Fortner had known Bill Richardson since the early 1980s: Fortner’s mother, Cornelia Trimble, was a prominent Democratic activist who served as a Richardson county coordinator. When Richardson was in Congress, Fortner said, the two would frequently chat about their mutual interests in energy policy. 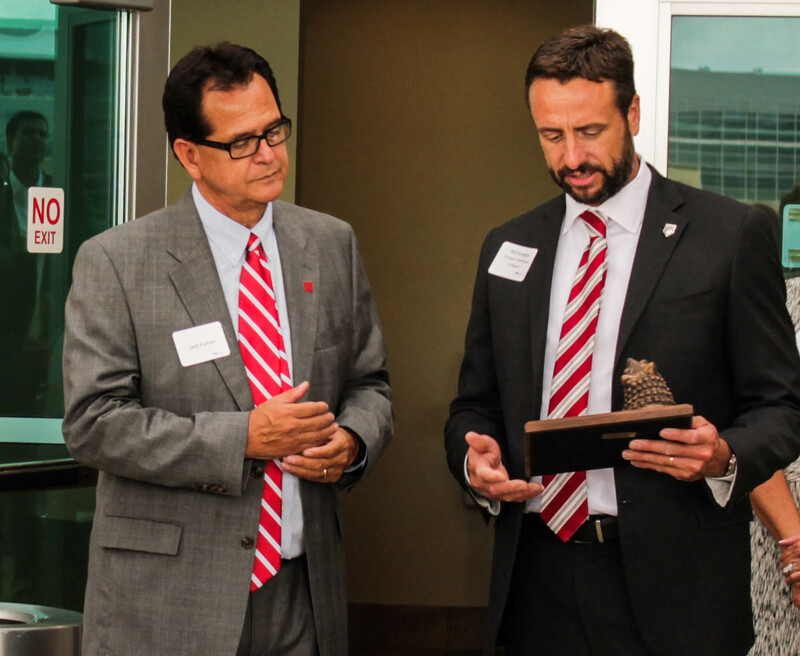 But few passions run as deep for Fortner as his love for the Lobos and during the 2004 campaign, he spoke frequently with Richardson about issues facing the university. Richardson, looking for bipartisan appointees, decided to keep Fortner on the Board. “I felt he was good for the university,” said Richardson. “He was very dedicated.” Jamie Koch, meanwhile, said that Fortner’s reappointment owed almost entirely to his mother’s connection. While staying in the good graces of the Democratic governor, Fortner continued to burnish his Republican bona fides during the 2004 presidential campaign. San Juan County became the anchor of George W. Bush’s surprising presidential campaign victory in New Mexico, and Fortner was credited with being a key part of the northern New Mexico organizing effort. Five years later, Fortner contemplated making a run for the governorship himself. He flew down to a state Republican gala at the start of the primary season, but quickly immediately decided his heart wasn’t in it. Fortner soon announced his support for Martinez, then a long-shot candidate. His anointing boosted her chances in San Juan County, where the white, conservative Republican base has often been unreceptive to minority candidates. In addition to mobilizing voters, Fortner personally donated over $40,000 to Martinez’s 2010 campaign, and bundled Brink’s-loads more. And unlike others of her key contributors, who soured on the administration during its iron-handed first term, Fortner continued to support the governor during her reelection. During the 2014 election, Eaves, an active Democratic donor, said that Fortner had persuaded him to contribute to the governor in order to get reappointed to the Board of Regents. By Koch’s telling, Fortner had all but convinced Eaves he would be a shoe-in if he gave enough money, but Eaves said that he was under no such assurances. During that campaign cycle, Eaves contributed $10,000 to a pro-Martinez super PAC and another $4,800 to Martinez’s campaign. As regent president, Fortner was viewed as a less imperious overseer, but still highly political. He did little to dispel his critics’ concerns of a lack of independence, rarely voting against the governor’s interests. Rather than asserting himself as a hard-charging advocate for the university, Fortner settled into a more comfortable role as Lobo emissary, trying to cultivate good vibes between the administration and UNM through, among other things, the power of The Pit. “Susana Martinez knew nothing about sports — nothing at all,” said one of the governor’s former aides. But soon after her election victory, McCleskey took Martinez to her first Lobo basketball game, and the proselytism took hold. Eventually, Martinez even requested that the governor’s seats be relocated from behind the visitor’s bench, where Richardson used to sit, to a nearer-at-hand position along the south baseline of the arena, catty-corner to the home team. With the program on the rise under Steve Alford, Martinez started making regular appearances at men’s basketball games. Sometimes she would be accompanied by her husband, Chuck; other times she would be joined by McCleskey. And when Martinez wasn’t using the seats, observers still frequently spotted McCleskey keeping them warm, despite the fact he had his own season tickets elsewhere in the building. In the early going, according to sources, Fortner served as the point person for arranging the governor’s Lobos itinerary. The governor made a tradition of traveling to Las Vegas to watch the Lobos and Aggies play in their conference basketball tournaments, often eliding her basketball excursions with political ones. In March 2012, she flew from a GOP fundraiser in Denver to Portland, where the Lobos played their second-round NCAA Tournament game against Louisville. The following year, she took in the Lobos’ NCAA Tournament games in Salt Lake City, where she also attended a Republican Governors Association event. Despite Martinez’s developing interest in the program, sources said, Alford made only a minimal effort at reciprocating. Even as an assistant, it was Neal who would be mindful of seeking out the governor when opportunities arose. And when he got the head coaching job in the spring of 2013, Fortner saw a terrific, new bridge-building opportunity. According to multiple sources, it was Fortner who arranged that introductory dinner at the governor’s mansion in mid-2013. Various sources who interacted with Neal recall the coach’s frequent boasts about his direct access to Martinez. “They were on a speed-dial-type relationship, and he let people know,” said a former Athletic Department staffer. A few weeks later, Neal was spotted at McCleskey’s 40th birthday party, held under a tent in the back patio of the governor’s residence. Neal was also there at the Albuquerque Marriott on Election Night 2014, when Martinez celebrated winning her second term. According to multiple sources, Martinez had at one point wanted the basketball coach to join her on stage, but others intervened, thinking it unwise for Neal to be seen publicly endorsing a politician. Neal championed the governor’s summer reading initiative, while Martinez was an enthusiastic participant in the men’s basketball cancer awareness work. When former President Barack Obama came to New Mexico last summer, Martinez bequeathed him a Lobo jersey and a segment of The Pit’s original hardwood. The Martinez-Neal mutual admiration society was a source of first, amusement, and later bemusement at UNM. The governor’s fawning quotes to the Journal about Neal, for a June 2013 profile, produced more eye-rolling on campus than the ophthalmology department. Occasionally, colleagues would tease Neal about his texting buddy from Santa Fe, and several sources recall times when the coach expressed a bit of self-consciousness about what might be said of his relationship with the governor. Most often, however, he reveled in it. But the relationship would upset the natural order of things at the university: the pipeline to Santa Fe is supposed to run through government affairs and the school’s top administrators, not the basketball team. As for Fortner, with Martinez and Neal now exchanging emojis, he was less and less needed as a go-between. In fact, as the governor drew closer to the university, Fortner’s life — and the political tightrope he had so long negotiated — became treacherous. Although he was largely criticized for his subservience to Santa Fe, there was one propitiation Fortner refused to make. And, according to several knowledgeable observers, that may have been one refusal too many. In November 2012, Ryan Cangiolosi, Martinez’s deputy chief of staff, abruptly announced he was stepping down from the administration to become executive projects director at UNM Health Sciences. The announcement aroused cries of cronyism, as capitol watchers presumed Cangiolosi had landed the job thanks to the governor. Writing incredulously on his political blog, Joe Monahan heralded it the “Cangiolosi Coup,” comparing the situation to Billy Sparks’ dismount at HSC six years prior. The timing was also suspect: Not long before, Cangiolosi had been ensnared in the so-called “Emailgate” saga, after Martinez’s former campaign manager, Jamie Estrada, passed reams of illicitly obtained, compromising campaign emails to a Democratic opposition researcher, Michael Corwin. “Cangiolosi may be able to hide out at UNM but emailgate could bring him back into the spotlight,” Monahan prophesied online. But the Cangiolosi shuffle was not exactly what it seemed at the time. Several sources close to Cangiolosi said his decision to leave the governor’s office owed primarily to personal and family reasons. And while HSC leaders surely saw some benefit in having a former Martinez aide in their stead, sources said that Cangiolosi got the job without any assistance from the administration. In fact, it was quite the opposite: Cangiolosi’s departure inflicted a wound with Martinezworld that would come to jaundice relations between the university’s biggest component and the governor’s office. According to numerous sources, the impact of Cangiolosi on the public affairs of UNM cannot be overstated. The Martinez administration, those sources said, has made it painfully clear that his presence at HSC is untenable, if not an act of war. Last year, NM Political Report reported that Cangiolosi was one of 21 UNM employees who received letters warning that their jobs may be eliminated, due to governing consolidations between HSC and main campus. A number of key UNM officials and advocates suspect that Cangiolosi’s presence on the HSC staff was a principal reason why the governor so adamantly promoted that consolidation, in the first place, as well as why the administration has so fiercely opposed the construction of a new UNM hospital. How did Cangiolosi become the primo bugaboo in the overflowing ranks of Martinez apostates? Harvey Yates thinks he might have the answer. And his explanation highlights how the pages tend to stick together in the little black book of New Mexico’s politerati. Cangiolosi is a long-time friend and protege of Yates, a former state Republican chairman who was a big backer of Martinez’s in 2010. But over the course of the governor’s first term, Yates came to sour on her administration’s heavy-handedness, ascribing much of the blame to McCleskey. Yates has since become a prominent and public critic of the governor, while the administration has dismissed his critiques as the sour grapes of a donor who couldn’t gain access. Yates told NMFishbowl.com that Martinez’s staff was fearful Cangiolosi might share details with him about a controversial 25-year casino/racetrack lease renewal that had been awarded to the Albuquerque Downs in 2011. Martinez’s decision to approve the lease, despite the Downs’ history of financial delinquency, continued a troubling, Richardson-era pattern of governors giving sweetheart deals to racetrack owners that opened their wallets. Paul Blanchard, by this point, had been forced to put his Downs’ ownership stake in escrow, after being called as a witness by a federal grand jury in an unrelated investigation into Richardson’s activities. The Downs’ new majority partners were two Louisiana casino magnates and national GOP donors who saw to it that tens of thousands of dollars flowed into Martinez’s 2010 war chest. Over the next several years, the Downs saga revealed how a cluster of arachnid hacks weave the tangled webs in Susanaland. Among them: Darren White, who provided security consulting and lobbying services for the Downs; Pat Rogers, a Republican lobbyist and lawyer with close administration ties, who represented the Downs’ bid for a new lease; and McCleskey, who was discovered in leaked “Emailgate” messages having detailed discussions about the racino deal. Cangiolosi declined numerous requests to comment for this story. According to multiple sources, Cangiolosi was repeatedly interviewed by the FBI about the Downs deal, as well as for other inquiries into the governor’s inauguration and campaign spending. Ultimately, the Feds decided not to bring charges, but Cangiolosi was nevertheless in the administration’s crosshairs. UNM now found itself in the bullseye as well: it not only offered a future six-figure sanctuary for Martinez surrogates, but represented a last battlefield in which to claim a turncoat’s scalp. “An emotion often seen exuding from the 4th floor of the Round House is the desire for vengeance,” said Yates. Back in July 2011, Fortner was still very much ensconced in the governor’s favor when he took on his first big mission presiding over the Board of Regents: finding a new UNM president to replace David Schmidly. The stakes were extraordinarily high, given the faculty uprising that had recently transpired, and a state-wide budget crunch that narrowed any margin for error. The search process also gave an early opportunity for Fortner to distinguish his leadership from the Koch autocracy, although Koch would still be one of three regents on the 26-member presidential search committee. The committee included faculty and staff leaders and seven community members, one of whom was a particularly conspicuous, if fleeting, presence: Pat Rogers. “I put him on because he was a well-known lawyer in New Mexico and I went to undergraduate (school) with him and I have known him,” Fortner told NMFishbowl.com. “(Rogers) came to the first meeting and texted on the phone and looked at us all with disdain, because we are UNM — a bunch of crazy liberals,” said one UNM faculty member who served on the committee. That perception would be crystalized by emails Michael Corwin leaked to the Daily Lobo in August 2012, which showed that Rogers, inviolate of the committee’s confidentiality rules, sent McCleskey and Gardner the names of the two presidential finalists. Other leaked emails found Rogers continually imploring Martinez’s top lieutenants to get more involved in the search process. In another message, Rogers suggested that Martinez would need to execute this cleanup mission at the level of the Board. “You are going to need someone besides Fortner on the regents to keep Koch from manipulating the process,” Rogers observed. Rogers repeatedly suggested that Schmidly could be a useful ally in an effort to purify UNM of Richardson leavings, attesting to the fact that the outgoing UNM president had no allegiance to the former administration. Curiously, not even a month later, a $5,000 donation was made to Susana PAC by William Spears, the chairman of the Dallas-based Energy Education, Inc. Spears had never donated to Martinez before — according to online public records, he had never donated to a New Mexico politician before — but he was known to have long-standing ties with Schmidly. Years before, Spears’ company came under scrutiny in Albuquerque after it won a no-bid $1.9 million contract to do energy conservation consulting for UNM. According to the Journal, Schmidly had been responsible for kick-starting that deal. Schmidly acknowledges knowing Spears but insists he had no financial stake in his company’s business and that “there is not a connection” between him and the campaign contribution. Through a spokesperson, Spears declined to comment. Despite his email exhortations, Rogers didn’t appear that committed to engaging in the presidential selection process, itself. A few months later, Rogers was forced to resign from his law firm after the publication of another leaked email, this one in which he criticized Martinez — jokingly, he would later claim — for having “disrespected” the memory of George Custer by participating in an annual state tribal summit. While it is not known how McCleskey and Gardner responded at the time to Rogers’ UNM-related missives, his directives would be embarked upon in due course. The struggles of UNM’s next president were foreshadowed by the faulty process that promoted him. Collectively, the short-list of UNM presidential candidates were light on pedigree and full of baggage. One of the five finalists, Meredith Hay, the provost at the University of Arizona, had the pejorative reputation of being a “lightening rod”. Another finalist, Elsa Murano, had been forced to resign as president of Texas A&M three years before, amidst a torrent of criticisms and poor performance reviews. Ultimately, the choice came down to Kent State Provost Bob Frank and Idaho Provost Douglas Baker. Frank had some baggage of his own, having rankled colleagues at Kent State and, before that, the University of Florida. Indeed, at Kent State Frank was known to proudly carry the nickname, “the hammer,” and was seen treating his role as that of an enforcer. According to two knowledgable sources, one of the UNM search committee members received a private reach-out from a friend at Kent State, advising against hiring Frank. Baker, according to sources, was regarded as the more faculty-friendly candidate, but he lacked health science experience, which was considered essential for the UNM job. Frank, a trained psychologist, had served as dean of public health at UF. In the assessment of several committee sources, it broke down as such: Baker had the disposition, but Frank had the resumé. What’s more, Frank had deep connections in the state and the university, something Fortner placed a premium on. Having grown up in Las Cruces, Frank graduated from Mayfield High before going on to earn his three degrees at UNM. A former UNM faculty leader, who was also involved in the search, said the root of the problem was with the regents. “The hammer” proved to be a rather crude instrument to operate such a finicky machine as UNM, which became evident from almost the moment Frank assumed the presidency in June 2012. Frank’s supporters conjured him as a Dr. House-like figure: brilliant, well-intentioned and valuable in spite of certain indelicacies. And he certainly had his fans. But a number of other sources who interacted with Frank said he was short-tempered, sharp-elbowed and, in all, diplomatically ill-equipped to handle the increasingly political job before him. Some of Franks’ supporters tried, as time went on, to sand off the rough edges, giving Frank behavioral tips. For example, one source said he was advised not to be on his phone the whole time while he was at a Lobo sporting event. But Frank was difficult to curb, said sources, especially as he tried to assert his leadership on a campus ruled by feudal barons. “Bob Frank is a guy who does not suffer fools — at all,” said the former faculty leader. In April 2015, the Board of Regents hired Agnes Mura, a Santa Fe-based leadership development coach, to spend five months working with Frank. The president was said to be amenable to the instruction, and some hoped Mura’s contract would be extended by the regents, but that was decided against. Throughout the bumpy road, Fortner stood by Frank who was, at the end of the day, his pick. “I don’t think he was doomed from the start,” Fortner said. But if not then, Frank may well have been just 200 days later. On December 18, 2012, the state Board of Finance convened for an agenda that included the proposed new $146 million, 96-bed hospital at the University of New Mexico. While not always present for these regular meetings, Gov. Martinez made certain to wield the gavel that day. She was flanked by her chief of staff, Keith Gardner. The hospital proposal had already been signed off on by UNM’s regents and the New Mexico Department of Higher Education. But two months prior, the Finance Board had postponed its vote, with members saying they needed more information and wanted to wait until after the presidential election to decide. The school had spent the intervening months lobbying additional stakeholders and trying to respond to the board’s written queries. At the crucial December meeting, both Bob Frank and Paul Roth, the chancellor of the Health Sciences Center, jointly presented. In making his introductory remarks, Frank spoke about the essentialness of the hospital infrastructure to the state and how it had been failing to keep up with needs. He noted that parts of the current hospital dated back almost 60 years, and that a lack of available beds had forced hospital staff to turn away more then 700 families the previous year. The discussion grew tense as Finance Board member Robert Aragon challenged the presenters over the claims of overcrowding. Frank pushed back hard, at times disdainfully, such as when he expressed bewilderment over why Aragon didn’t understand that hospital beds could not be counted interchangeably. Gardner challenged UNM’s claim that its hospital had maintained 90 percent occupancy, suggesting that there were contradictory figures from the Department of Health. Martinez also repeatedly tried to stab holes in UNM’s need arguments. At one point, when the governor questioned the constitutionality of a $95 million Bernalillo County property tax, used to reimburse UNMH for serving indigent patients, Frank chastised her for raising the issue in an impropriate forum. Despite clear signs of opposition, Martinez indicated in the meeting that she thought the project could ultimately go ahead. But to Frank’s obvious frustration, she concluded the meeting by requesting that UNM answer additional questions about occupancy rates. Frank again snapped back at the governor, saying that the administration should have provided these questions beforehand. Even those who agreed with Frank on the substance of his qualms, found his etiquette that day worrying — this was not the kind of administration to back-sass with impunity. But Frank would continue to press his luck. According to multiple sources, in a subsequent meeting with the Kellogg Foundation, which included Martinez’s Education Secretary Hanna Skandera, a still-smarting Frank openly questioned how committed the governor really was to the interests of children in New Mexico. It was a highly inflammatory remark, given how much Martinez had defined herself as an advocate for kids. The comment quickly got back to the governor and Frank’s name was duly inscribed in the Martinez book of the damned. But UNM sources recall a number of other such instances in which Frank assailed Martinez in mixed company. Invariably, the comments would telephone-tag their way back to Santa Fe, deepening the freeze. The heedlessness of Frank’s criticism was maddening to even his most loyal supporters: the administration’s capacity for spite was already legion, by this point, and here was UNM’s top wolf repeatedly poking the bear. “(Frank) was pretty ham-fisted, and really horrible at public relations,” said the ex-UNM administrator who left this year. If the governor needed to dig up any more fodder on the UNM president, she had a perfect source. Around the same time as the Board of Finance meeting, Duffy Rodriguez, a former Martinez budget official, left the administration to take a job as Frank’s executive assistant and chief administrator, for $127,500 a year. From the start, her posting in the president’s office was a subject of serious head-scratching within the university; some administrators speculated that she may have been installed as a mole to keep an eye on things. A source close to Frank said that the president was initially keen about the hire, thinking Rodriguez’s experience in high levels of government would benefit UNM. But things quickly got rocky. “Part of her difficulty was her tendency to view the university through the lens of governor’s beliefs and interest,” said the source, reflecting Frank’s view of the situation. Rodriguez did not respond to emails seeking comment. Despite her Richardson legacy, Rodriguez was known to have the blessing of Gardner and McCleskey, and reportedly operated with outsized authority within the administration. And unlike Cangiolosi, who landed at UNM a few weeks before she did, Rodriguez continued to maintain strong ties to the governor. Then, after just 13 months on the job, Rodriguez quit UNM, citing personal reasons. The source close to Frank said she resigned while he was traveling abroad, leaving a note on his chair. Not long later, she returned to the administration and, last July, was appointed Secretary of the Department and Finance Administration. She replaced Tom Clifford, who retired to join UNM’s Board of Regents. Recognizing how precarious his situation had become, Frank and his allies made some last-ditch efforts to calm the waters. A few weeks after Rodriguez’s departure, Frank sent a letter of support for the nomination of Martinez’s Education Secretary Hanna Skandera, after the Senate initially deadlocked on her confirmation. But there wasn’t much gain left to be gotten. Bob Frank’s tart tongue was one fatal flaw, but another serious shortcoming seemed to be an insufficient ardor for the governor’s most cherished Lobo pet. Following Steve Alford’s departure, Frank had conveyed his desire for the university to conduct a full-fledged, national search for the school’s next basketball coach. But he nonetheless signed on to the accelerated decision of promoting Craig Neal from within. Several key returning stars, from a team that almost reached the Sweet 16, had threatened to transfer if a new regime was installed. And by reputation — if not reality — Neal had been responsible for much of the program’s success under Alford. “It became clear to me I had one smart and ferocious wolf right in my backyard, and the conversation was over,” Frank said at the April 2, 2013 press conference announcing Neal as head coach. However, Frank’s appreciation for Neal’s smarts and ferocity would erode after the 2013-14 season, when the Lobos lost to a lower-seeded Stanford team in first round of the NCAA Tournament. In any case, sources said that Frank was perturbed by Krebs’ decision, feeling that the school had been outfoxed by Neal. And he didn’t necessarily keep those feelings to himself. A flash-point came when the Lobos went to Puerto Rico that November to play in a pre-conference tournament. Things did not go well: Cullen Neal, the coach’s son, suffered a season-ending injury in the tourney’s first game and the team would lose two of the three contests. Frank, who didn’t frequently travel with Lobo sports teams for away-games, was in attendance in Puerto Rico. Holding court with a small group of boosters, sources said, Frank complained about Neal’s coaching. However, unbeknownst to the president, Neal’s father-in-law was within earshot of his comments, and word promptly got back to the coach. “It was about three years before he found out that this was a reason Neal became so remote,” said the source close to Frank. “Ideally, the AD would have provided this information to the president.” But the source said that the cold-shouldering had actually gone both ways on the trip, when Krebs and Neal declined to invite Frank to join them at a group dinner for the tournament’s participants. While Neal struggled to find wins, Frank, a former UNM swimmer, struggled to assert himself with the Athletic Department. Sources said that Frank found a more receptive audience in Lobo football coach Bob Davie and gravitated to his program, which played into ongoing strife between Davie and Neal. According to multiple Athletic Department sources, Neal thought that Davie’s program was the beneficiary of an unfair double-standard. Neal privately complained that, while he was frequently criticized for showing favoritism to his son, Cullen, Davie got a free pass for his team’s off-the-field drama, including a number of sexual assault allegations made against football players. Neal and others in the basketball program began taking a mental inventory of Frank’s (perceived) displays of disrespect, such as when the president would show up to home games wearing a salmon-colored shirt or other non-cherry regalia. And Frank made little effort to convey impartiality: he would regularly tweet kudos to the football team and other UNM sports programs, but delivered few virtual posies for men’s basketball. Another fly in the ointment was familial: Bob Frank’s son, Dan. After working for Maestas, Dan Frank moved to Los Angeles to become a basketball agent, joining the now-defunct super agency, Relativity Media. His main ticket into the player representation game was his friendship with Chandler Parsons, the current Memphis Grizzlies player, and a college classmate of Dan Frank’s at Florida. The president’s relationship with the coach hit a low point the following season, Neal’s third, when the basketball team traveled to another pre-conference island tournament, this time in Hawaii. In mid-December 2015, former UNM Basketball Operations Director Cody Hopkins abruptly left the program. Initially, the school stayed mum on the reason for his departure, and Hopkins would later tell NMFishbowl.com that Neal had pledged him privacy while he underwent alcohol treatment in Texas. But 10 days later, right before the Lobos took the court for their first game in Hawaii, the school released a press statement announcing that Hopkins was under investigation by UNM’s Internal Audit department for roughly $63,000 in unreconciled purchases on his university credit card. While the statement came from Krebs, multiple sources said the issue had been forced by Frank, who viewed Hopkins’ behavior as a potentially explosive scandal. 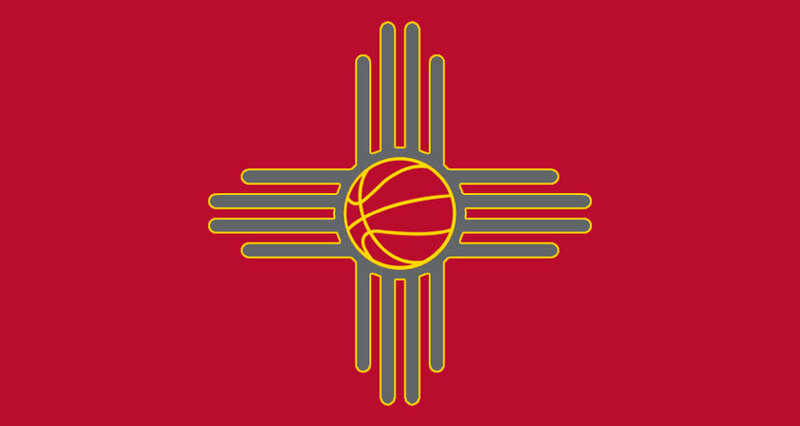 Neal was incensed, according to multiple Athletic Department sources, viewing the press release as Frank’s attempt to undermine his program while he was 3,000 miles away from Albuquerque. Hopkins has argued that he became a sacrificial pawn in a chess fight being waged between UNM’s Athletic Department and administrators on main campus. In a phone call with Hopkins’ father, Neal had also said that “internal politics” was driving the issue, according to contemporaneous notes taken by Jerry Hopkins. On the advice of a friend, Cody Hopkins said, he hired Albuquerque attorney Paul Kennedy to represent him against potential criminal charges. Kennedy, a former state Supreme Court justice, is better known these days for serving as Gov. Martinez’s personal lawyer. Hopkins said that he was unaware of this connection at the time he retained Kennedy’s services; he is now being represented by a civil litigator in Texas. The entire episode demonstrated the limitations on Frank’s authority, and the consequences of crossing Team Martinez. According to the source close to Frank, the president was told in a “face-to-face meeting” with Rob Doughty and Marron Lee to keep his hands off athletics. Though they arrived at their grudges separately, the governor and the coach now had something else to bond over: Bob Frank, a common enemy. Fortner describes the Martinez administration’s focus on UNM as a “natural progression,” but many observers saw it as having dramatically intensified by her second term. By now, Cangiolosi had been talking to the Feds; Fortner was exhibiting signs of divided loyalties; and Frank was pushing buttons. It was time to heed the advice of Pat Rogers and “get a grip” on the university’s governance. “It was a bit of surprise that there were any holdovers at all, from Richardson to Martinez, given how vitriolic Martinez was against anything that had Richardson’s smell on it,” said a former UNM administrator. But Koch, according to knowledgable sources, had convinced Martinez that he could use his relationships with Democratic lawmakers to get her other regent appointees confirmed by the Senate. The new regents would join Martinez’s two previous appointees: Retired Air Force Lt. Gen. Bradley Hosmer, a political independent and former superintendent of the Air Force Academy; and Suzanne Quillen, a registered nurse, Democrat and hospital executive from Las Cruces. By comparison, Doughty and Chandler didn’t appear to have much in their resumés referring them for public university oversight — their backgrounds were devoid of higher education, executive or public health leadership. To the governor’s cynics, however, their appointments made all too much sense. In 2011, Martinez had appointed Doughty to the state’s racing commission, where he eventually rose to chairman. Although he was never a central figure in the racino saga, his position on the Board did give Doughty some oversight responsibilities of the Albuquerque Downs. In 2012, Doughty had been drafted by Martinez’s allies to run for the state Senate seat that covers northwest Albuquerque. Cangiolosi, according to a knowledgable source, had been the point person between the administration and the candidate. The campaign hired Red Tag Strategies, a direct-mail and media firm owned by Adam Feldman, a McCleskey disciple who previously served as the governor’s director of Boards and Commissions. Paul Kennedy, Martinez’s lawyer, chipped in with a $500 campaign contribution. And yet, despite all the help, Doughty lost decisively in the primary to Mark Moores, who currently holds the seat. But Doughty’s tethers to the governor would still pay off royally. Since 2010, his Albuquerque-based law firm has done over $1.5 million of business with the state, according to figures maintained by the New Mexico Sunshine Portal. In 2014, the Santa Fe New Mexican sleuthed a connection between Doughty’s law firm and a political action committee, New Mexicans for Honest Leadership, which sent campaign mailers in support of re-electing Dianna Duran, then the Secretary of State. As NM Political Report later found, the law firm had made hundreds of thousands of dollars from taxpayer money for work it contracted with Duran’s office. Like Doughty, Chandler was also a conferee of the Martinez political machine. In 2010, he ran as the Republican challenger for state Attorney General, facing the Democratic incumbent, Gary King. McCleskey handled the media buys for Chandler and Martinez’s campaign donated an $85,000 in-kind contribution. (Former Lobo and NFL football player Hank Baskett likewise got into the fun, contributing $3,500 to the campaign.) Chandler eventually lost to King by seven points. Subsequently, Chandler left his district attorney job and became treasurer of Advance New Mexico Now, a pro-Martinez super PAC that has paid hundreds of thousands of dollars to McCleskey’s company and Public Opinion Strategies, the polling firm where Nicole McCleskey is a partner. In 2014, according to campaign finance records, Advance New Mexico Now also gave a six-figure contribution to New Mexicans for Honest Leadership, the organization with Doughty ties. Advance New Mexico Now spent $1 million during the 2014 cycle, largely targeting Democratic legislators in competitive races. This became the focal point of Chandler’s contentious March 2015 Senate confirmation hearing over his UNM regent appointment. Chandler defended his background in politics by saying he was no different than Koch, who sat in the front row of the hearing, alongside Doughty, in a show of support. Before the Senate sealed Chandler’s fate, rejecting his appointment by a 23-17 vote, Koch demonstrably submitted his resignation to the Board of Regents. In a public letter, Koch harangued his fellow Democrats, declaring, “I cannot recall a lower point for the Senate.” Chandler’s rejection was effectively the end of Koch’s credibility with the Martinez administration, but at the governor’s request, he agreed to stay on through the remainder of the year. After Chandler’s elimination, Martinez tapped another friend and former prosecutor, Marron Lee, as a recess appointment to the Board. A few months later, Lee’s husband, Michael Nelson, was hired to serve as a deputy cabinet secretary in the state’s Human Services Department. While Martinez lambasted Senate Democrats for stalling on her Board selections, she alone held captive the student regent selection process. In the fall of 2014, UNM’s undergraduate and graduate student organizations submitted their regent shortlists to Bob Frank, who in turn passed them along to the governor. The next student regent was slated to begin a two-year term on January 1, 2015. But as that deadline approached, there was no word from the governor’s office. Despite follow-up inquiries from student leaders, Santa Fe continued to stonewall, even as the new year came and went. Finally, at the end of April, three months after the student regent was supposed to have been seated — and just weeks before the school year ended — word finally came that Martinez was unsatisfied with all the proposed candidates. On the cusp of summer break, it was too late for either of the student organizations to vet a new list. Moreover, it was widely agreed among the student government leaders that this crop of candidates had been quite robust, although the applicants did skew liberal. “It became apparent that the politics of Santa Fe took precedence over the formal process involving student voice in the selection of the next student regent,” said Rachel Shank (née Williams), who served as president of ASUNM at the time. Then on June 9, 2015, Ryan Berryman was named student regent as a recess appointee. To those involved in the formal selection process, Berryman’s name had come out of nowhere, but he was not entirely unknown. Berryman, by then a graduate business student, was about to serve his fifth year as a manager on the men’s basketball team. His responsibilities within the program were soon to increase, when he was pressed into service as volunteer operators director, following Hopkins’ December departure. How did Berryman wind up the student regent? While Berryman excelled academically, and was well-liked among his peers, there was necessarily a concern on campus that he was compromised — at least in appearance. No source I spoke to could recall a previous time a governor picked a UNM student regent with total disregard to the input of the school’s student government. But it was not the last time Martinez would take this tact. There were immediate questions about whether it was appropriate for Berryman to serve as both regent and interim basketball operations director, a job for which Hopkins had been paid $76,500 a year. The regent bylaws expressly forbid Board members from receiving any kind of compensation from the university while they served. According to UNM employment records, Berryman was not directly compensated for his men’s basketball work while regent, although it appears he may have been the recipient of other student grants or scholarships at the time. When NMFishbowl.com made a public records request, seeking information on all monies the school gave Berryman, UNM declined to provide it citing student privacy laws. Even if Berryman wasn’t earning a salary, the situation fed into misgivings about who he would be inclined to serve: his direct supervisor, Neal, a man who was prepared to hire him full-time after his appointment; or the student body. Friends of Berryman said that he accepted the appointment in the spirit of integrity, and handled his duties accordingly. “I believe he worked as hard if not harder than the majority of regents to be prepared for meetings,” said Quillen. With the Board of Regents more tailored to the governor’s liking, a new era of insolence was aborning. The Martinez administration was now preoccupied with the goings-on at UNM — and the school was completely caught off guard. Still, there was a growing desperation for someone on campus — anyone — to keep things copacetic with the governor. Craig Neal, for all he may have lacked as a basketball coach, had proven effective on this front. But there was solid evidence to indicate that the administration had an interest in keeping Neal around. Two sources recall McCleskey having a closed-door meeting with Craig Neal in his office, in the spring of 2016, to discuss the escalating public relations mess surrounding Cullen Neal. Craig Neal had created national headlines when he publicly claimed that his basketball-playing son had received death threats from Lobo fans, an assertion later contradicted by UNM police. In retrospect, several sources said, there was a distinct gulf between the perception of Neal’s influence with the governor, and the actionability of it. “I can’t think of a single capital improvement project at the university, much less the Athletic Department, that (Martinez) has been helpful on,” said Eaves. A review of capital appropriations to the Athletic Department during Neal’s time as head coach does not convey the work of a rainmaker. During the 2014 and 2015 legislative sessions, UNM received appropriations of $100,000 and $150,000, respectively, for Davalos Center improvements. During the 2016 session, the Athletic Department received $531,000 out of a $1.3 million request to improve the wi-fi capabilities of The Pit. A week after the Lobos’ 2015-16 season ended, Ryan Berryman found himself in a different sort of frenzied arena. In a packed Ballroom C of the UNM Student Union building, the school’s regents had gathered to vote on a dramatic change to the governance structure of Health Sciences. Berryman was positioned to break the tie. The proposed measure would be a reversal of the Board’s unanimous 2010 decision to reorganize the HSC under a separate governing board of directors. The idea behind this was that the health sciences component of the university had grown so large as to require a distinct authority. An outside consultant’s report commissioned by the university noted that hospital governing boards traditionally deliberate in upwards of 30 hours a month. “These types of time commitments are not possible for Regents who must also govern the other parts of the University of New Mexico, as well as, in most cases, maintain their private businesses and means of income,” the report stated. The HSC Board of Directors would be comprised of three regents, the hospital board’s chair, and three members of the public. Despite repeated pledges of unity from HSC officials, others outside health sciences chafed at the prospect of a university entity, with roughly two-thirds the budget of the remaining campus, becoming increasingly autonomous. The HSC board also presented an impediment to the Martinez administration as it tried to seize control. 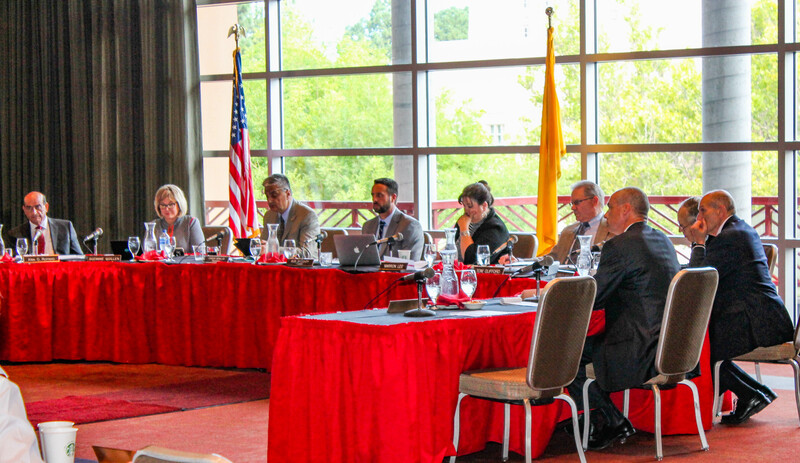 While most of the big decisions the HSC Board voted on were then referred to a vote by the full panel of UNM regents, it did have some direct-approval powers. The three community members on the HSC board, of which Eaves was one, further diluted the authority of UNM regents Martinez could reliably count on. Two weeks after the story ran, Fortner removed Quillen and Brad Hosmer from the HSC Board, and appointed himself and Marron Lee to serve alongside Rob Doughty and the two community members. “We weren’t making progress on the hospital, so I thought I would switch the committee around,” Fortner told NMFishbowl.com. That June, Doughty wrote a letter to Fortner, requesting a “special exception” to the HSC bylaws that would allow five regents to serve on the Board of Directors, instead of three. This would further cede authority from the HSC Board to the regent leadership. Fortner consented to Doughty’s request, the bylaw was changed, and Koch and Berryman were added to the HSC Board later that summer. Mel Eaves could see the writing on the wall. UNMHSC Board of Directors Meeting, February 5th, 2016 from UNM Health Sciences Center on Vimeo. “I think everyone who has tried to delay this hospital should be ashamed of themselves,” Eaves told the audience. Lee, sitting with folded arms next to him, stared daggers at Eaves as he spoke, while Fortner buried his eyes in his notes. In a subsequent interview with NM Political Report, Eaves alleged that the Martinez administration was opposing a new hospital because it wanted that same money to be used to offset the state’s Medicaid liability. In the past, UNM had given $20 million annually to the state’s Human Services Department, later to be reimbursed by the federal government. That month, however, the Human Services Department — for which Mike Nelson, Lee’s husband, served as deputy cabinet secretary — requested $50 million from the hospital, without providing the necessary time or means for reimbursement. 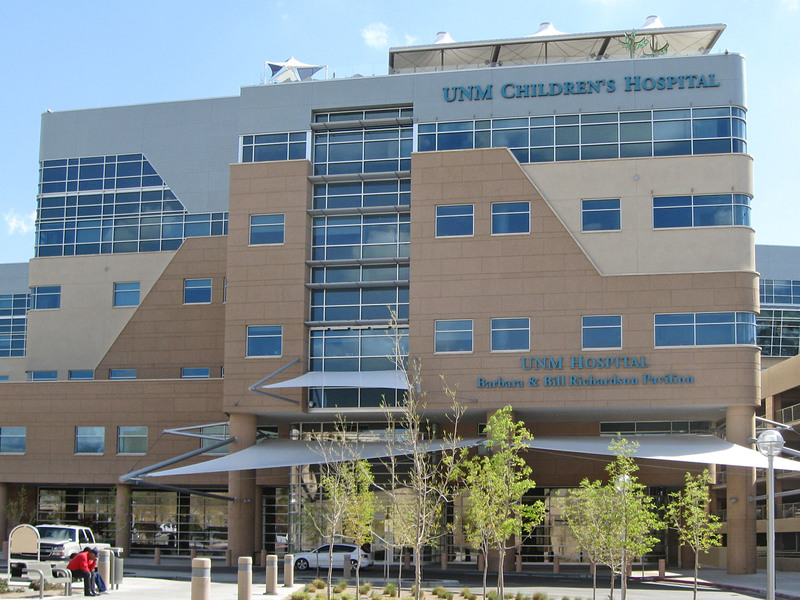 Previously, an outside law firm hired by UNM had determined that the hospital funds could not be used for any other purpose without first approval of several stakeholders, including Bernalillo County. With this in mind, UNMH rejected the state’s request. Bob Frank, though a strong proponent of the new hospital, had advocated for doing away with the HSC board, which also placed limits on his authority. Shortly after becoming president, Frank railed against the Health Sciences set-up to the Journal, in comments that were widely interpreted as a shot across the bow at Paul Roth. The spectacle that was the March 14, 2016 Board of Regent meeting began with the election of Doughty as the new Board president. He was approved by a 4-2 vote, with Quillen and Hosmer the “nays”. Lee was subsequently elected vice president and Fortner was chosen as secretary-treasurer. From there, a tense scene unfolded in the Student Union ballroom, where an audience of several hundred had crammed in to watch. Beginning the lengthy public comment section, Roth noted that the regents had provided just a 72-hour notice for the agenda item regarding the HSC reorganization. Frank said that he had been unaware of the proposed changes and Quillen noted that, as a regent, she had only learned about them days before the vote. Dozens of university and community leaders spoke, one after another, in defense of the current HSC governance structure. It was assumed that Doughty, Lee and Fortner would vote the way the administration wanted; Quillen and Hosmer had given clear indication they would oppose the measure. The wildcard was Berryman, the student regent. In the days leading up to the meeting, according to several sources, Berryman had been called or visited by a handful of past student regents, encouraging him to resist the political pressures from Santa Fe and vote his conscience. In his few remarks before the vote, Berryman said that the original intent of creating a stand-alone board was to provide more streamlined information to the regents. He suggested that this would be similarly accomplished by bringing HSC under the direct authority of the Board. With Berryman voting in the affirmative, the motion to amend the governance structure of HSC passed 4-2. A torrent of criticism followed, much of it directed at Berryman. “I think many students, even in that one meeting, saw Berryman as a pawn for Martinez,” recalled Sara Collins, who served as ASUNM’s chief justice at the time. “To me it was obvious he was doing the governor’s bidding,” said Eaves. “I have reason to believe Ryan was under considerable pressure to vote in favor of the dissolution of the HSC Board of Directors,” said Quillen. But sources who are close to Berryman dispute the idea that his vote was anything other than heartfelt. And Berryman wasn’t the only tiebreak possibility. Although he won’t say so directly, Fortner now indicates that he may regret his decision to side with the Martinez majority. “It doesn’t seem like it has had a major effect on things, but if Paul Roth thinks differently, I would defer to him,” Fortner said. With a weakened president, and a newly harnessed Health Sciences Center, Doughty and Lee went about fortifying their power, indicating to others that you were either with them — and the governor’s mission — or doomed to be marginalized. Last September, Bob Frank announced that he would not seek a second term as president when his contract expired the following May. In so doing, he signed an agreement with the regents that entitled him to move into a $350,000-a-year position with HSC, after his current term was up. The report, produced by Albuquerque attorney Alice Kilborn, had been signed off on by Elsa Cole, the UNM legal counsel. The timing of the Nov. 3 report and the mode of its distribution raised questions, given that Frank had just shaken hands with the regents on a lucrative exit deal. Moreover, Kilborn’s report found reason to cite Frank’s “perceived unprofessional communication” with Gov. Martinez and Keith Gardner, an odd thing to broach in a document supposedly evaluating his workplace conduct. In addition to the Kilborn report, two other accusatory documents were simultaneously leaked to the press: an internal audit claiming Frank had been over-reimbursed by the university for $5,500; and the results of an investigation claiming Frank had failed to properly report his paid time off. Within days, Frank had lawyered up and fired back claiming, in a tort notice to the regents, that the reports’ release amounted to an act of defamation. Frank alleged that the documents had been created and then leaked as a pretext for firing him before his contract was up, thereby negating the HSC faculty appointment he was entitled to thereafter. The Albuquerque Journal’s editorial page cast the doings as “an expensive cloak-and-dagger-drama,” wondering, rhetorically, whether this really just came down to Frank having pissed off the Martinez administration. While the governor’s office stayed thunderously silent, several prominent community leaders rallied to Frank’s defense. But a week later, Frank and the regents struck a new deal, in which he agreed to leave at year’s end and take a different health sciences post that paid $190,000 in salary, roughly half the salary of the previous offer. The job was scheduled to begin in June, and Frank confirmed to NMFishbowl.com that he is currently serving in that role. However, Frank couldn’t quite help himself two months later, when he took to Twitter to chide Craig Neal’s program for again failing to break the 20-win mark. Neal could at least take comfort in having survived his nemesis, but that satisfaction would only last for three more months. Following a third consecutive season devoid of post-season play — and a mounting player mutiny — Neal was let go on March 31, just before the clock struck midnight. “Craig was so worried about getting people fired that he got everybody fired, including himself,” said a former Athletic Department staffer. Two weeks before Neal’s dismissal, Krebs had issued a statement of support that Neal would return for the following season, his fifth. The reversal of that decision came, according to multiple sources, under the supervision of Rob Doughty. As NMFishbowl.com previously reported, cell phone records from the time show Krebs and Doughty in constant contact. Sources said UNM had, in the final hours, offered Neal an opportunity to coach one more season if he agreed to a restructured contract that eliminated the $1 million penalty for early termination. Neal was said to be willing to consent to the deal, in principal, but there was a sticking point over contract language that suggested he could be immediately canned without recourse once the signature ink had dried. The governor’s office was kept abreast of the Neal termination, said sources, although there are differing versions on how involved it was. Given the administration’s more pressing concerns at the time, and Neal’s disesteem in the community, it seemed he was no longer worth the political capital to fight for.
.@thelobolair If Gov was meddling in Lobo Basketball, Craig Neal would still be coach. Period. Nevertheless, in a farewell letter addressed to “My New Mexico Friends,” published in the Journal on April 7, Neal made sure to acknowledge his ultimate boss. “Thank you to Governor Martinez for her friendship and her passion for improving the lives of our state’s children,” he wrote. That same day, Martinez made national news when she vetoed the entire higher education budget for the upcoming fiscal year. Her decision, which was met with broad condemnation, came after a series of clashes with Senate Democrats over regent appointments. In January, Martinez nominated Don Tripp, the former Republican Speaker of the House, and John Ryan, a GOP lobbyist and ex-state senator, to replace Hosmer and Fortner. Tripp soon backed out, after a Senate panel raised questions as to whether the Constitution prohibited him from being appointed within one year of serving in the legislature. Martinez subsequently appointed Alex Romero, the CEO of the Hispano Chamber of Commerce. But Democrats refused to hold confirmation hearings and, to the governor’s exasperation, Fortner and Hosmer remained in their posts after their terms expired. When Berryman’s concluded at the end of last year, he was hired on as the full-time men’s basketball operations director under the new head coach, Paul Weir. Through an Athletic Department spokesman, Weir declined to answer questions as to why he retained Berryman in that role. For the student government associations, the process to replace Berryman was dishearteningly déjà vu. Martinez again rejected the list of names submitted by ASUNM and GPSA, despite it being another bumper crop of well-qualified candidates. The associations hastily submitted two additional candidates, including former football player Garrett Adcock, now a law student at UNM, who Martinez nominated on March 7. Collins, who was among the initial group of student regent finalists, said that during her interview with the governor’s office, she was asked specifically what she thought about Martinez’s educational policy. The four-person search committee to hire Craig Neal’s replacement as men’s basketball coach included Rob Doughty, Paul Krebs, David Harris and Janice Ruggiero, who would soon after replace Krebs as interim Athletic Director. Among the candidates who publicly emerged was James Borrego, the former Albuquerque Academy star, who is currently an assistant coach with the San Antonio Spurs. Borrego also happens to be the son-in-law of Paul Kennedy, Martinez’s lawyer. While there were various social media reports that Borrego would get the job, negotiations ultimately broke down. At the press conference introducing Paul Weir as the Lobos’ new basketball coach, Krebs insisted that the governor’s office did not mettle. “I never heard from anybody from Santa Fe,” he said, according to the Journal. Despite Doughty’s involvement, Krebs declared that it was he who “drove the search,” noting that it was not unprecedented for a regent to participate in Athletic Department hirings: Fortner had been involved in the search that picked Bob Davie; and Koch had almost unilaterally hired Krebs. In April, I visited Koch at his office in Santa Fe, where he was deep in research for a long-planned autobiography. Koch told me that over the last several years he had conducted lengthy interviews with 39 different high-profile figures from his days around UNM and Roundhouse politics. With the help of a ghostwriter, Koch is now putting the finishing touches on the book and hopes to shop it to a publisher soon. “I am not going to (UNM) Press because if they awarded it to me, I would be criticized,” he groused. While we sat around his conference table earlier this year, Koch summoned a thick, three-ringed binder full of interview transcripts. I spied Krebs’ name on one of the divider tabs. But what of the involvements of ex-regents? According to several sources, Koch had been highly instrumental in the university calling off a decision earlier this year to end its skiing programs. In May, NMFishbowl.com reported that Koch had made numerous calls to Krebs’ cell phone in the lead-up to the reversal. Koch acknowledged that he lobbied for the program’s continuation, but dismissed the idea that his input was decisive. Following Krebs’ resignation in June, amid the two state investigations into the Athletic Department, Doughty appointed himself to lead the search committee for the school’s next AD. “I don’t think he should have done that,” admonished Koch. Jack Fortner managed to waltz between three different gubernatorial administrations and two different parties, but the music was about to stop. In arguably his boldest move as a political appointee, Fortner declined to voluntarily step down from the Board of Regents at the expiration of his term on Dec. 31, further emboldening Senate Democrats who refused to confirm his replacement. Despite his five-figure contributions to Martinez’s election campaigns, and years of loyal soldiering, he had nonetheless fallen out of favor. His support for Bob Frank and his unwillingness to turn against Ryan Cangiolosi might have freighted the camel, but according to a knowledgeable source, the back-breaking straw was truly trivial. By then, a subversion campaign against Fortner had already taken hold. In late April, two anonymous tips were called into a UNM hotline, alleging that Fortner had improperly billed to UNM personal plane travel expenses, which he had incurred while flying to watch his daughter, a Lobo softball player, play games. The tipster also alleged that Fortner had thrown himself a “personal ‘political fundraiser’” at the University House, the UNM president’s residence. At the same time, a mysterious Twitter account, @NewUNMLeaders, surfaced on the scene, castigating Fortner’s leadership on the Board and making similar accusations as the hotline tipster. It appeared that @NewUNMLeaders had been retrofitted from a previous account, given that it had already amassed almost 1700 followers and had originally joined the social network in 2012. The specificity of the allegations suggested that someone with an insider’s perspective, perhaps at the level of a regent, was behind them. And to expositors of Roundhouse bloodsport, the attacks bore the marks of Martinezworld, which is known to have gone after the governor’s irritants in similar ways before. In light of the allegations, the regents hired former New Mexico judge Bruce Black to investigate the claims, paying him $10,000 for the work. In his final report, Black determined that Fortner had not violated any laws or school policies. “The use of public media to broadcast such anonymous allegations and the inevitable substantial and costly investigations that follow is however, troubling,” Black wrote. In a confidential letter to Doughty, UNM attorney Elsa Cole wrote of her intentions to keep secret the report clearing Fortner of any wrongdoing. “It has not been and will not be shared with anyone but you and President Abdallah,” Cole wrote in the memo, adding that Abdallah had been asked to destroy his copy of the document. Nevertheless, NMFishbowl.com obtained a copy of the report in June through a public records request. Fortner submitted his resignation to the governor on May 22. In the salutation line of her note, she crossed out “Mr. Fortner” and wrote in the word “Jack”, a final soupçon of friendliness to a supporter who was no longer needed. “I don’t think they were ever nearly as loyal to Jack as he thought they were,” said Eaves. Fortner, whose métier is making nice, continues to tread carefully on the subject of his exit, although he does link the sequence of mischief against him to the administration’s ultimate objective. I asked Fortner how things had gone so wrong for him, after so many years of getting by just splendidly. At present, UNM’s Board of Regents is as politically-charged and divisive as can ever be remembered. Following the HSC vote last year, Doughty removed Hosmer and Quillen — the only two non-Republicans of the six, full-term members — from all but one of their committee assignments, and he appointed himself, Marron Lee and Garrett Adcock to the all-important Health Sciences Committee. In an email, Hosmer blamed “many” of the university’s current problems on the Board. On August 15, the Board of Regents unanimously approved the hiring of an architect for a new, 408-bed UNM hospital. The planning phase is expected to take up to a year and a half, which means it will almost assuredly fall into the lap of the next governor. Some observers think the current administration might soon shift its attention to a different preoccupation, alleviating some of the political pressures at the university. For many within the university, inattention would be a best-case option. But Doughty and Lee have so far shown little inclination to unclench their grip. Earlier this month, Lee vigorously clashed with the school’s art faculty over a decision to relocate studio space to the UNM’s Biology Annex. And Doughty has dispensed with suggestions to tap the breaks on the presidential hire. In her letter to the regents last month, Pamela Pyle, the Faculty Senate president, asked the Board to let Chaouki Abdallah continue as interim school president until spring 2019, arguing that UNM needed to “arrive on more stable footing before handing off the reins to another leader.” Rebuffed by Doughty, Pyle last Tuesday submitted to the Board a Faculty Senate Resolution demanding a formal regent vote on the request for delay. The resolution went unresponded to last week, as Doughty and Lee were busy hiring UNM’s new athletic director, Eddie Nuñez. UNM must respond by Sep. 14 to a letter from its accreditor, The Higher Learning Commission, which has demanded an update on the ongoing state audit into the Athletic Department. Meanwhile, numerous university sources have expressed concern that Barbara Damron, Martinez’s higher education secretary, will ultimately wind up with the president’s job, clearing the deck for other administration officials, like Gardner, to scurry aboard the ship. In April, Damron, a former UNM oncology nurse, publicly distanced herself from Martinez’s higher education funding veto. Some skeptics saw this as a phony effort to show her independence from the administration, a contrivance to pave her way to the presidency. When reached by email last week, Damron initially said she would respond to a request for comment, but never did. Given the current makeup of the Board of Regents, it stands well within the realm of possibilities that, once again, a hugely consequential governing decision will come down to the tie-breaking vote of a student regent (Adcock) appointed under questionable circumstances. In recent weeks, Martinez’s focus has turned southward, where New Mexico State University’s regents, four of whom are her appointees, declined to extend Garrey Carruthers’ contract as chancellor. The governor’s office later issued a forceful denial when a Journal reporter asked if Martinez had an interest in taking Carruthers’ job after she is out of office. But it’s not a crazy thing to ponder: as her second term comes to a close, Martinez’s once bountiful array of options has withered substantially. Amidst the 2016 election, the governor incurred the implacable wrath of President Donald Trump; and she has spent the last seven years estranging many of the key GOP figures in the state. The Land of Enchantment, which Martinez once led with 60-plus-percent popularity, is fast becoming enemy territory. Last May, Harvey Yates defeated Pat Rogers in the race to serve as the state’s Republican National Committeeman. Seven months later, Ryan Cangiolosi won the contest to be the chairman of the state party, a further blow to the Martinez machine’s purchase on power. Earlier this year, Cangiolosi switched positions within UNM Health Sciences to a job outside the radiation zone of the chancellor’s office. But as McCleskey plots his future, it seems that he has at least a new side project to bide his time with: basketball coaching. Last summer, the McCleskeys filed paperwork with the Secretary of State to create Dream Basketball Training Center LLC. They now operate an Albuquerque hoops gym out of an office park off Jefferson Street. In July, they hosted a two-day camp for kids. Former Lobos Obij Aget and Devon Williams, two of Craig Neal’s favorite players, served as instructors. “I got originally referred by Coach Neal to work with Jay and then he just asked me to help him out,” Williams told NMFishbowl.com. According to the camp’s online brochure, participants would “learn key fundamentals in a small group setting.” Alas: who knows better than McCleskey how to set hard picks and play on the attack? Two Thursdays ago, a crowd of several dozen gathered on the third-floor balcony of the Domenici Center for Health Sciences Education, not far from UNM Hospital, to honor Jack Fortner for his record-setting tenure as regent. The attendees included office-seekers, Lobo coaches, university boosters, and current and past members of the Board of Regents. The weather was pleasant, the hors d’oeuvres were plentiful, and the chat was lighthearted and gracious. If one didn’t know any better, you could have easily mistaken this political ritual for a party. Reading from prepared remarks, Rob Doughty, the man who replaced Fortner as regent president — and then watched as his colleague was torpedoed into resignation — presented a plaque commemorating his predecessor’s 19 years on the Board. The two of them stood there smiling, next to a door that read “no exit”, as Doughty bathed Fortner in scripted praise. “Beyond being a regent, Jack is a true Lobo for life,” Doughty said. But that might not be enough. And, if history is a guide, that might not be the end of the story. In recent weeks, according to sources, Fortner has been angling for a return to the Board, and has made this plainly known to those who could decide such things in the not-too-distant future. (There are 483 days until the next governor takes office; and yes, everyone is counting). When I asked Fortner if he wanted to serve as a regent under a fourth administration, he wouldn’t rule it out. Correction: This article previously misstated the total number of regents that simultaneously serve at UNM. The correct number is seven, not six.